As I mentioned in my last post, fall is my favorite season and pumpkin desserts are such a big part of that culture. This recipe was one that I made when I had my bakery in Riverside, and it was a fall feature at Lift Coffee Shop when it was on Central the year that I provided the pastries for them. I always bring this to potlucks or serve it when we have guests because if you are a pumpkin person it is always a hit. 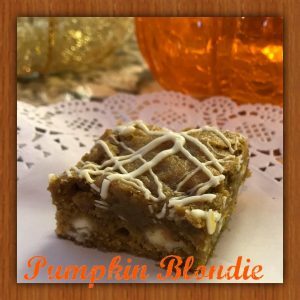 It is a tender cakey bar, full of pumpkin flavor and rich, warm cinnamon, ginger, nutmeg and clove notes that will make your mouth sing. I also add white chocolate chips to give it nice texture. I drizzle a little white melting chocolate over the top for a beautiful finish. That step could certainly be skipped if you are in a hurry or don’t have any on hand, but aesthetics are important when you are serving and it really doesn’t take too long. These are so easy to make and they freeze well if you somehow manage to have some left over. Grease and flour (or use bakers spray) a 9×13-inch baking dish. I always line mine with foil for easy removal and clean up. If you do that, spray the foil not the pan,. In a medium bowl, combine the flour,cinnamon,nutmeg, ginger cloves, baking soda and salt. Stir together and set aside. In the bowl of an electric mixer fitted with the paddle attachment, beat together the butter and sugar on medium-high speed until light and fluffy, about 2 minutes. Fold in the white chocolate chips with a rubber spatula. Bake until the edges begin to pull away from the sides of the pan and a toothpick inserted in the center comes out with just a few crumbs, about 35-40 minutes. Transfer the pan to a wire rack and let cool completely before cutting. Once cool, heat the melting wafers in a microwave safe bowl 30 second intervals on 50% power until they are completely melted, stirring between each interval. Use a spoon to drizzle it over the cooled bars. It will harden in about 30 minutes.